Nicely-sized compact nearfield powered monitors - worth a listen if you are in the market for a pair. Sharp imaging. Tonal adjustability. Connectivity options. Default sound lacks a little bass. Back panel controls might be a pain for some setups. 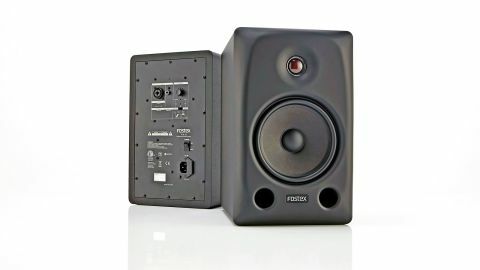 The new PX-6 Professional Monitor Speaker from Fostex is the larger of two in the PX range, the other being the PX-5. It's a powered two-way nearfield monitor that is equipped with totally new 6.5-inch LF and 1-inch HF drivers and features extensive onboard DSP - Fostex says that the superior digital FIR filter is designed to enable unprecedented accuracy in imagery through precise time alignment that would not be possible with analogue crossover designs. Practically sized and with a weight that won't strain your muscles when moving them, the PX-6s feature the curvy front edging that's prevalent among the latest breed of nearfields. They look smart with a black rubberised finish and feature a Fostex logo that lights up orange when they are powered up. "There a range of adjustments available to tailor the monitors to your tast"
An electricity-saving standby mode kicks in after four hours of no signal causing the illuminated logo to flash, returning to full illumination with signal. The soft-dome 1-inch Urethane film-laminated, polyester fibre dome tweeter is unusual in that it is a red colour, although, perversely, it's the (unremittingly black) 6.5-inch woofer that Fostex describes as Crimson. It also says it is constructed of aramid fibre with mixed diaphragm impregnated with resin to enhance fibre bonding for higher rigidity. Two bass reflex ports towards the bottom of the cabinet complete the look. Connection facilities are provided for a range of different users and their cabling. You get a combined balanced XLR/unbalanced jack input and an unbalanced RCA (phono) input. There's also a range of adjustments available to tailor the monitors to your taste, courtesy of a single rotary encoder surrounded by a ring of LEDs. You can adjust Volume, Trim (fine tuning of the volume), HF level (+/-3dB in 0.3dB steps) and LF roll-off frequency - plus you can also adjust the phase if you are using the monitors in multi-channel monitoring environments. A switch combined with a push of the encoder selects whether you are adjusting Volume, Trim, Treble or Bass. You then turn the encoder as necessary with the LEDs indicating your selection. There are 20 values available for each but only 11 LEDs, however, as each step is notched, you know where you are and can set up each monitor equally. We, of course. realise that putting the knob and LEDs on the front would spoil the aesthetics, but getting round the back to tweak things could be a pain in some set-ups, still, for most users it's a done-once set-'em-and- forget-'em process. With 50 watts driving the low-end and 28 watts driving the top, the PX-6s should be plenty loud enough for a small/medium sized room. The DSP certainly seems to be doing its stuff when it comes to imaging as everything seems pinpoint accurate and precise across the stereo field, so no worries in that department - likewise with the depth of the soundstage. Running the monitors in the default settings as supplied, without any of the HF or LF adjustments dialled in, we felt that the sound was lacking a bit of bass, but adjusting the roll-off frequency downwards improved matters to a point where we felt more comfortable with making bottom-end mix decisions. Overall there were no nasty surprises in the sound, the overall spread of frequencies seemed fairly naturally balanced with nothing unduly emphasised or lacking, and the top-end adjustment seemed tastefully-engineered to brighten things or subdue them slightly to suit your preferences. So, are these monitors that you'd be able to use on a day-to-day basis? We'd say so. They are competent performers that, at an RRP of £475 for a pair, are not overpriced, but they do have plenty of competition, as there is a massive choice of similarly sized and powered 2-ways out there.